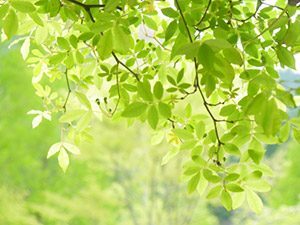 The Wakaba-iro, is a soft yellow-green, such as the young leaves of the summer before the vegetation. Speaking of “Wakaba” There is a spring of the image, but the summer as a season word. It is the spring of color “Wakana-iro” a little with a strong color blue than, will be a wide color range of which represents a leaf of fresh trees before summer. By the way, Wakaba-iro is not a traditional color of old, has appeared in the later Meiji modernization. Besides the color to get the “Waka” has such as “Wakakusa-iro” “Wakanae-iro” “Wakatake-iro” “Wakame-iro”, it comes from most of the fresh green of flowers.